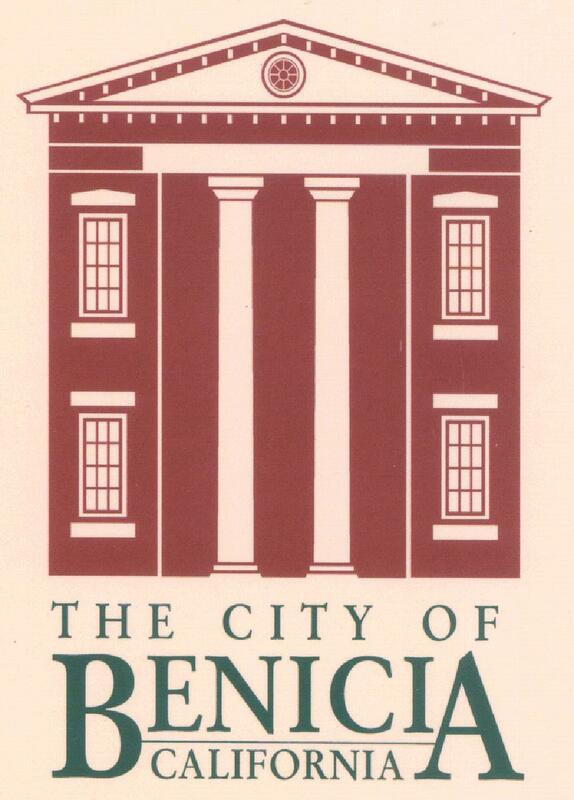 As the first incorporated city in the state of California, Benicia features some of the most extensive and captivating history, and historical buildings, in all of California. As you walk the streets of our charming historic downtown district, with its rare Victorian and early California architecture, you will be swept back to an engaging time, when day to day life was a struggle but the reward was to watch a city and state being born. We hope you enjoy your walking tour! was on the west side of First Street on parcels of property known as Semple Slips. 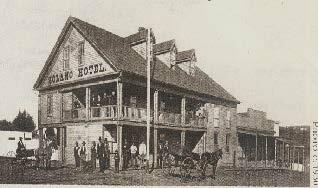 Built in the late 1870’s and later used as a rooming house called the Alamo Rooms, this site was famous or infamous as a popular bordello. It now serves as a seafood restaurant. Port Costa, across the strait, to its present location. Garske’s Marine Services, Inc. and boatyard have occupied the site since 1950. 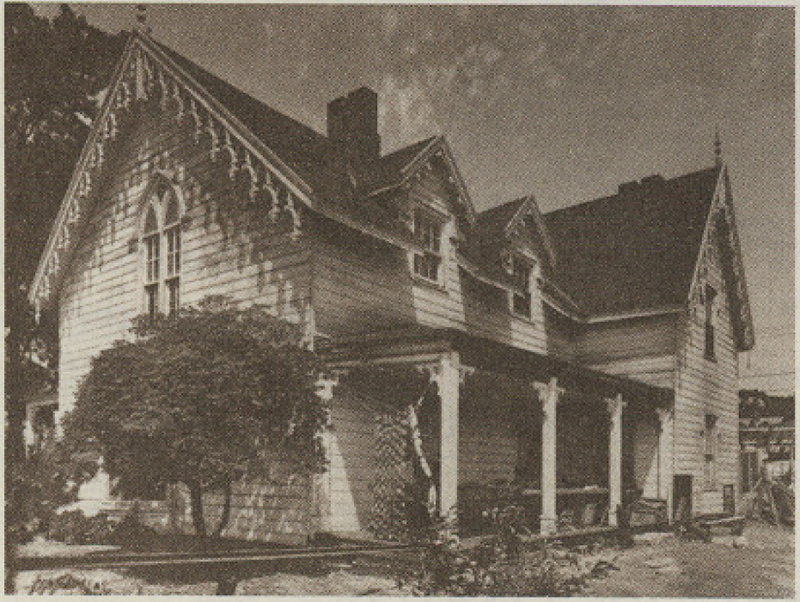 The Von Pfister Adobe was built in 1847 and was the third building erected in Benicia. Edward Von Pfister operated a general store and saloon in 1848, when a messenger from Sutter’s Mill stopped on his way to Monterey with a sample of gold nuggets. Unable to contain his secret, he informed those present of his precious cargo. Efforts are underway by the Benicia Historical Society to restore this most valuable and historical structure. Built in 1850-51 and originally located at the East 5th Street wharf, this building served as a hotel for some members of the state legislature during the time when Benicia was California’s third capital. Daniel Hastings moved the present building to this site in 1856. 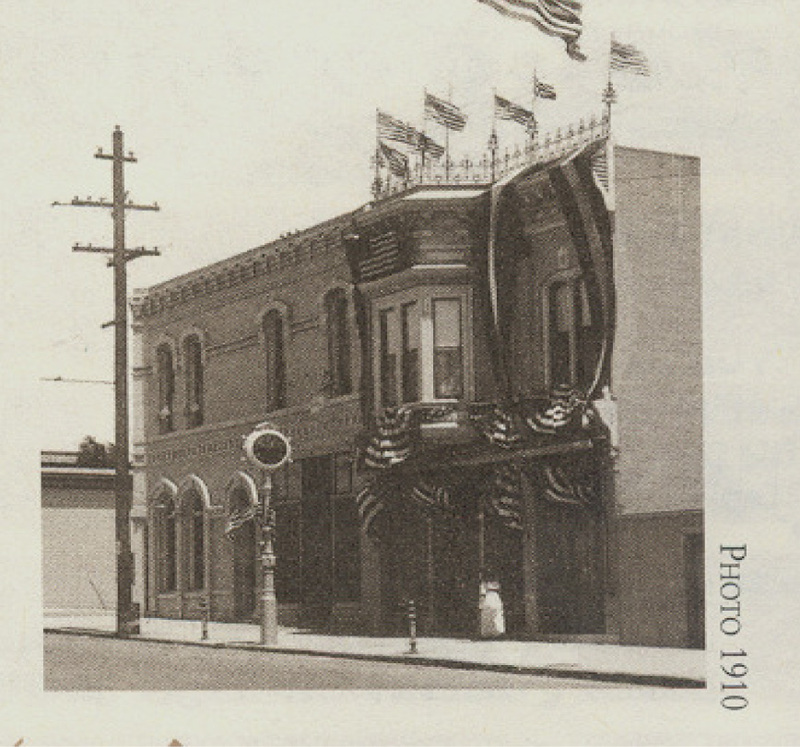 In its colorful history it has served as home to the offices of the “Solano County Herald” newspaper, a butcher shop, a dry goods store, a lawyer’s office, a Chinese lottery, a speak easy during prohibition days, a bordello, an artist studio and a restaurant. This structure was prefabricated in Maine and reassembled in its present location. The small two-room annex in the rear of the building is believed to have been built here prior to 1848 and contains an original chimney among its other features. 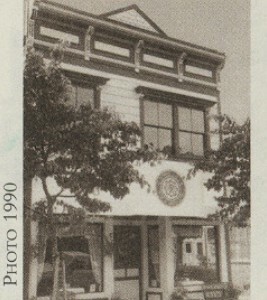 Prior to its most recent renovation in 1988, this residence was called the “What Not Shop,” an antique and collectibles store. This little New England style “salt box” house overlooking the Carquinez Strait is one of several such homes prefabricated on the East Coast and sent in sections to California to be reassembled here during the Gold Rush Days. 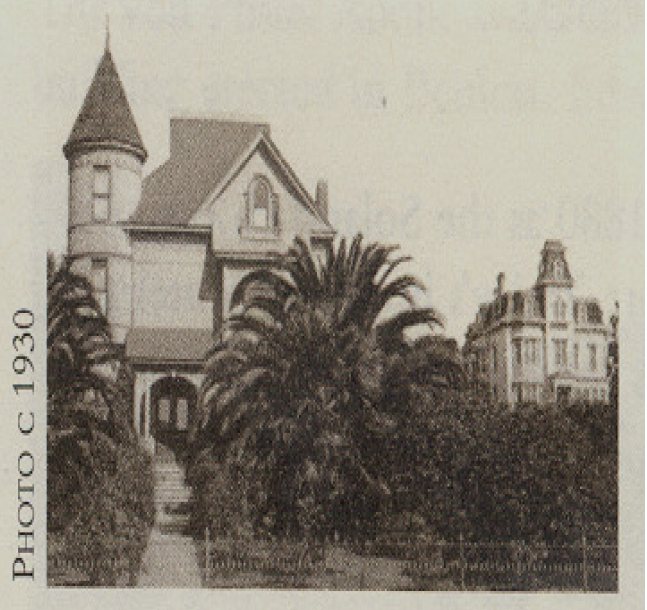 This home was moved here from Port Costa c 1879 after a disastrous fire destroyed all of the buildings on First Street between “D” and “E” Streets in 1867. This building, actually two sections of one building, was originally on the west side of First Street, north of “A” Street. A rooming house, this building dates from 1879-1880. It was moved from its location extending over the water. 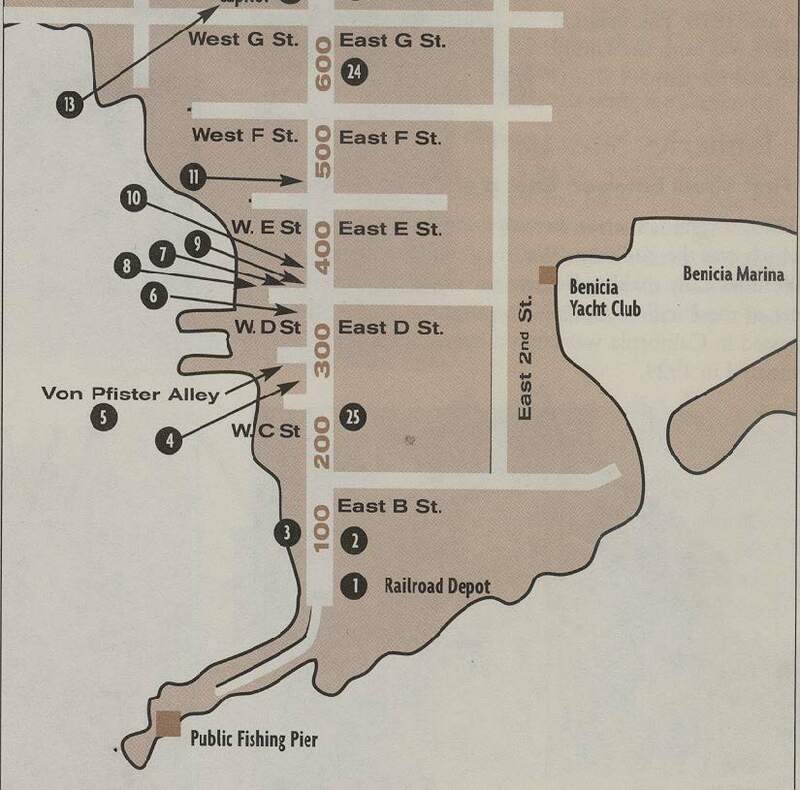 Its current location is between “D” and “E” Streets. 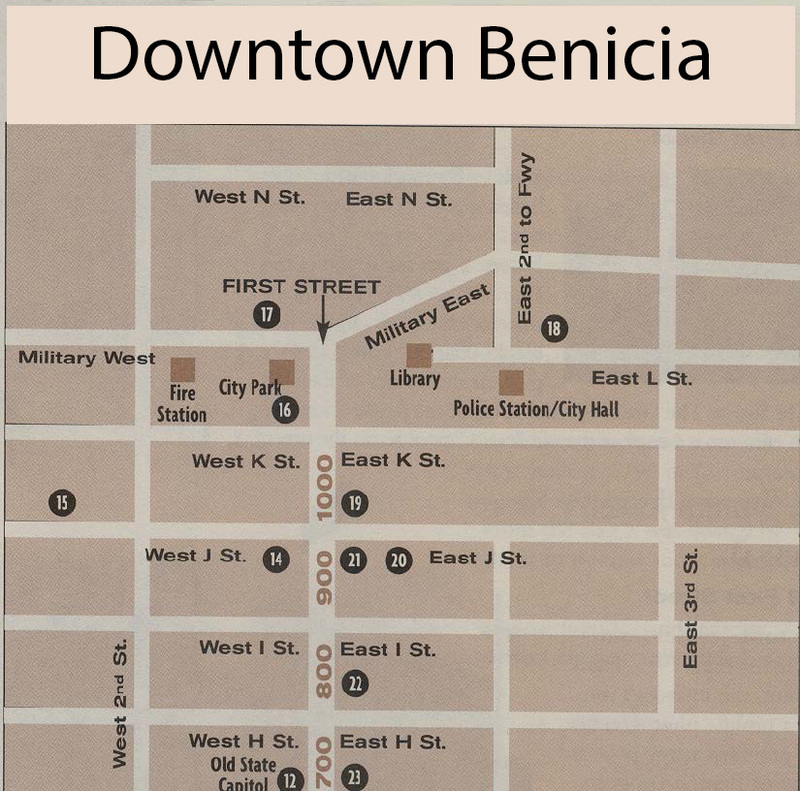 Many legislators resided at the hotel during the months when Benicia was the state’s capital. The register included the names of such famous persons as Ulysses S. Grant, William Tecumseh Sherman, John A. Sutter, Governor Riley, Colonel Silas Casey (the Indian Fighter), F. L. Low (one of California’s governors), Judge Hastings of Hastings Law School fame and many others. 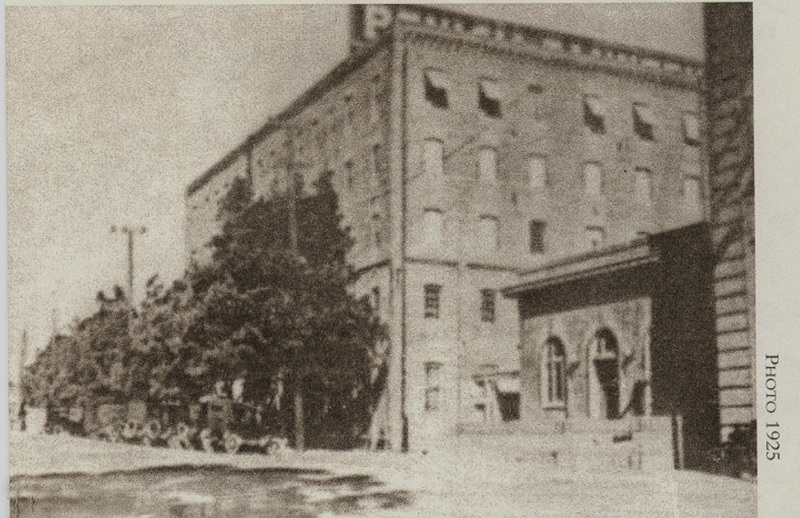 Fire razed the hotel in 1945. This site is an example of the mutable nature of Old Town. The second story of the building you see today was moved to this site in 2000. 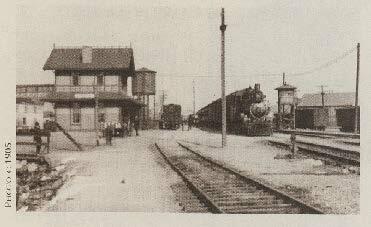 It was previously the second story of the Jurgensen’s Saloon (1892) which was located down First Street north of the S. P. Railroad Depot. 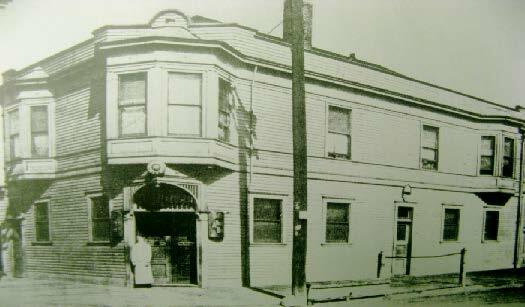 A frequent customer at the Jurgensen’s Saloon was the world famous author, Jack London. This handsome brick building was completed in 1852 for use as a City Hall. It served as the State Capitol Building during 1853 and 1854, when Benicia was the capital of the State of California for a period of 13 months. The Senate Chambers were on the first floor, and the Assembly met on the second floor. In addition, there were several committee rooms. In 1854 the building also housed the State Treasury since no wooden structure was considered safe for this purpose. Historians record that there were good wooden sidewalks from the Capitol building to the town so the building could be reached dry-shod in all seasons. This charming residence was once a Gold Rush hotel on First Street. 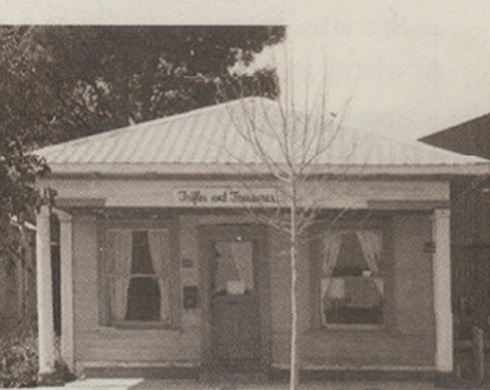 Following a fire in 1856 it was purchased by a Swiss-born Benicia merchant, Joseph Fischer, who had the building moved to its present location. Here he had it turned around, added porches, a kitchen, servant’s quarters and privies. 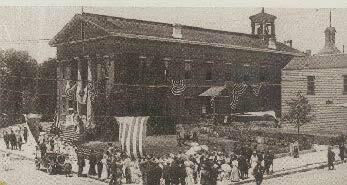 The first Masonic Temple in California was constructed in 1850 on land donated by Alexander Riddell and with lumber donated by Benicia founder Robert Semple. The lower floor of the building was used as a courtroom and country offices prior to completion of the State Capitol building in 1853. 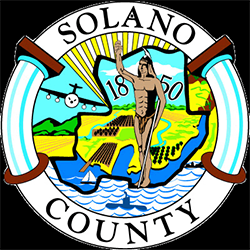 Benicia was the county seat for Solano County at that time. The second floor of this building is virtually unchanged and has remarkably ornate woodwork made by California frontier craftsmen. Built by Franklin and Henrietta Riddell Fish about 1900, this Queen Anne Victorian home, though a relatively standard design, was unusually wellconstructed. With restoration, it has survived its rival, the Hastings mansion, visible in the background of this historic photo. In April of 1849 the Reverend Sylvester Woodbridge, a Presbyterian missionary, became the minister of the first Protestant Church built in California. Here, in a simple Gothic Revival style church, he preached on Sundays, conducted Benicia’s first public day school on weekdays, and slept in a sailor’s hammock in the building at night. Historians record that the reverend’s sympathies with the South during the Civil War caused dissension among the members of his congregation, causing his departure and the eventual closing of this church in 1871. Today, the site is a City Park and gateway to Old Town Benicia. In 1854 Mother Mary Goemaere, a French-born Dominican nun, arrived in Benicia by chartered schooner from Monterey, establishing St. Catherine’s Academy at this site. Begun initially as a girls’ boardschool, the Academy became a co-educational boarding and grammar school in 1889. St.
Catherine’s served educational needs of this area for over 100 years. It was razed in 1965 to make way for a shopping center. This colonial Revival house, with a deep-set portico and a vertical emphasis in its design, was build for H. Kullman, owner of Kullman-Salz Tannery in 1907. Later sold to J.L. Sanborn, it has been for many years an antique store operated by the Lundin family. In 1864 Captain Julian McAllister purchased a typical New England salt box home build in 1790 in Torrington, Connecticut, had it dismantled and shipped it around the Horn to San Francisco. From the Bay it was floated by barge on the Carquinez Strait to Benicia and reassembled at its present site. The rectory still has its original fireplace and staircase. In 1865 a master bedroom and kitchen were added. The present church was built in 1859. Lay readers conducted the early services, among them Captain Julian McAllister. 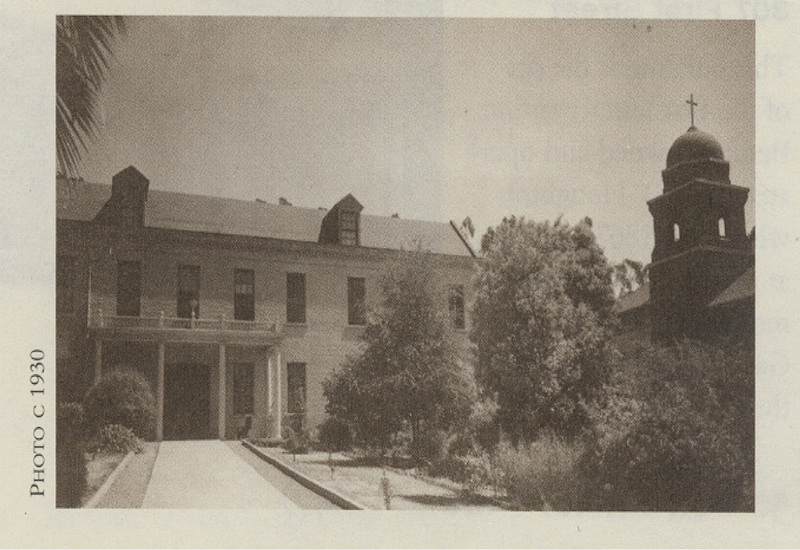 In 1876 St. Paul’s became the first Episcopal Cathedral for Northern California with the Reverend J.H.D. Wingfield as bishop. Work on the building was done by Scandinavian shipwrights from the Pacific Mail and Steamship Company. The nautical heritage is reflected in the ceiling, which resembles an inverted ship’s hull and is similar in design to the Norwegian Stave Churches. California redwood with wooden dowels is used in this edifice, which has a floor plan shaped like a cross. 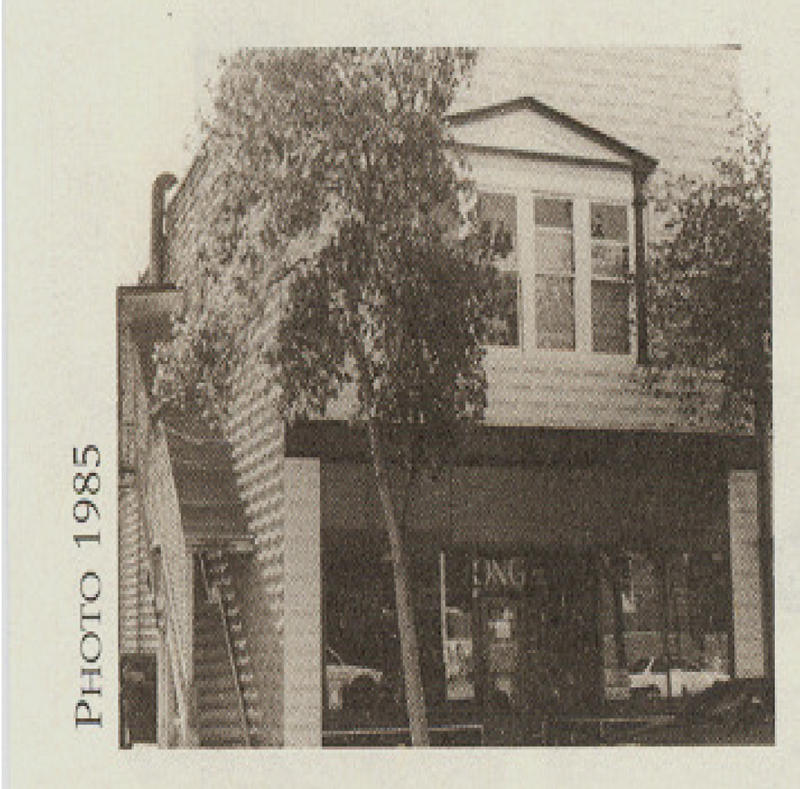 This building, which was built by the Singler family as a barbershop in 1894, is an excellent example of a typical wood frame commercial building in pre-1900 downtown Benicia. Utilized as a barbershop for nearly 50 years and then as a café, saloon, variety store and a card room, it was restored completely in 1989. It is now a tearoom featuring a design ceiling by Benicia’s own Bradbury & Bradbury Art Wallpapers. Built by Simon Johnston, this building was first a grocery store, but later and for most of its history it was the home of the Royal Bakery. The building materials included sandstone blocks quarried from a gravel pit near the corner of East 4th and H Streets. The Greek Revival detail of the façade above the main entrance is a copy of the old State Capitol across the street. across the street. The town jeweler from the 1880’s until 1935, Frank Stumm, the founder’s son, was a prolific photographer and provided many postcard views of Benicia between 1906 and 1918. The original building was both the family home and the store. By 1879, several tanneries were operating in Benicia, chief of which was the Kullman-Salz firm, which handled about 1,000 hides daily making Benicia the principal tanning center of the Pacific Coast. Over onethird of all leather processed in California was tanned here. Operations were terminated in 1929.